Geysers are spectacular, and rare around the world. In the 19th century there were an estimated 220 of these erupting hot springs in New Zealand, but by 2004 only 58 remained. Their steaming plumes, along with bubbling waters, craters and mud pools, attract thousands each year to the Rotorua–Taupō region. What causes hot springs and geysers? They are produced when water underground is heated, and rises to the surface. This is known as a geothermal system. Most geothermal systems are near volcanoes that have been active in the past, or are still active. Because of this, the ground is heated by molten rock, known as magma, which is close to the surface. Rainwater seeps through cracks in the rocks and down towards the magma, which heats it up. This makes it rise quickly back up to the surface. 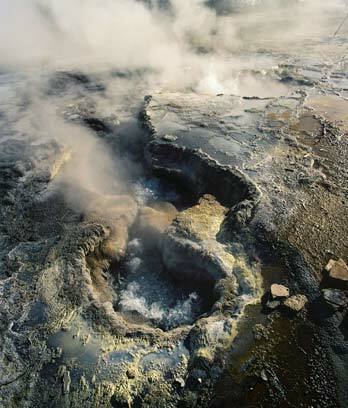 We see hot water and steam coming out of the earth as springs, mud pools or geysers. Clear spring, mud pool, or geyser? The clear water in boiling springs arrives rapidly from heated rock below. Māori used to cook in the Whakarewarewa springs, which are too hot for bathing. Mud pools form when steam and gas rise underneath rainwater ponds. The gases react with rocks to produce clay, which makes a muddy mixture in the ponds. Geysers form when pressure builds up beneath the ground, causing an eruption of hot water and steam. The volcanic zone of Rotorua and Taupō is famous for its mud pools that bubble like porridge, geysers spurting steam, and cascading terraces, which form as minerals from the hot springs precipitate on the rocks. Whakarewarewa has 500 hot springs and seven geysers. New Zealand’s largest geyser is Pōhutu, reaching 20 metres or more. Thousands of people visit every year. The only other place where you can see such big geysers is Yellowstone National Park in the USA. Springs can also appear on faultlines, where the rock beneath the surface is broken. The faultline provides a pathway for the hot water to rise rapidly to the surface. There are faultline springs at Hanmer and other places in the Southern Alps. Many hot springs, and the most spectacular geysers (shooting to 50 metres or more) have now disappeared. This is partly because of drilling for hot water, and building power stations. Today, the geothermal regions are recognised as rare, unique features that need protection.